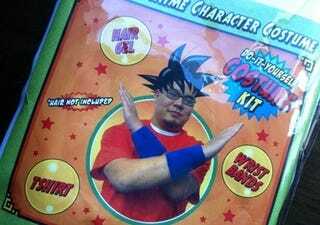 Can You Top This Dragon Ball Halloween Costume? This is a video game costume I won't wear for Halloween. Because I can't do the hairstyle, of course. Got any photos of your costumes-in-the-making? Add them here. Include #halloweencostumes. Namco sent a copy of Dragon Ball: Revenge of Piccolo to Kotaku's NYC branch office this week and bundled this "Instant Anime Character Costume." I might have to put this costume in the charity give-away pile.